Complete coverage of this incredible display of skill and strength. Every Strongman fan will want this DVD as it covers each intimidating apparatus and the champions’ skills in commanding its unique challenges with amazing determination and power. Multiple world records were set, and then the exciting finals on stage in front of thousands of fans, and a humorous interview by Arnold Schwarzenegger with the towering 6’8” 436 pound winner, Brian Shaw of the USA. Pictured below with Arnold. 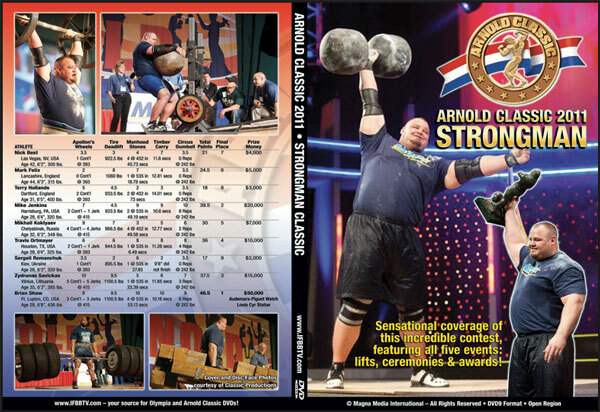 The DVD cover includes the complete scorecard from all five events: Apollon’s Wheel, Tire (Hummer) Deadlift, Manhood Stones, Timber Carry, and Circus Dumbell. Amazing feats of power and stamina! Click here for PREVIOUS YEARS OF THE ARNOLD CLASSIC STRONGMAN. Description of the 5 events to determine the winner of the 2011 Arnold Classic Strongman. 5. The Circus Dumbbell - Contestants will lift a replica of a "Circus" dumbbell, which were used by professional Strongmen from the early 20th century. The dumbbell weighs 202 lbs. and has a very big handle 3 inches in diameter. The men will use one hand at a time and lift the dumbbell overhead as many times as possible in 90 sec. "The Arnold Strongman Classic has been growing in popularity every year, and we are very excited that the world's best strong men are returning." said Jim Lorimer, Arnold Sports Festival co-producer.